Reliant Academy offers Comprehensive guidance for GATE,UGC NET,SET and all other competitive Examinations .We stay in front of the success curve by knowing what drives success in the competitive exam, Combining Theory, Practice and Time Management. At Reliant Academy we assure that , it will be endeavor to provide you all the opportunities & facilities of learning to groom you to become self confident in realizing you future goals. Getting yourself trained in clearing the competitive examination is the most important effort you can make to succeed in Today’s challenging world. The ability to transform your talent into succinct knowledge base ensures success. Top Net coaching Center in Kochi, Experienced Faculties and highest Results in Net Exams. Leading Coaching Center for SSC exams. Excellent Faculties and Competitive Learning Environment. We provide intensive training for the candidates who wish to apply for this job. Reliant Academy is the Best Place for GATE coaching at Kalamassery, Kochi. Experienced Faculties & Digital Class rooms. 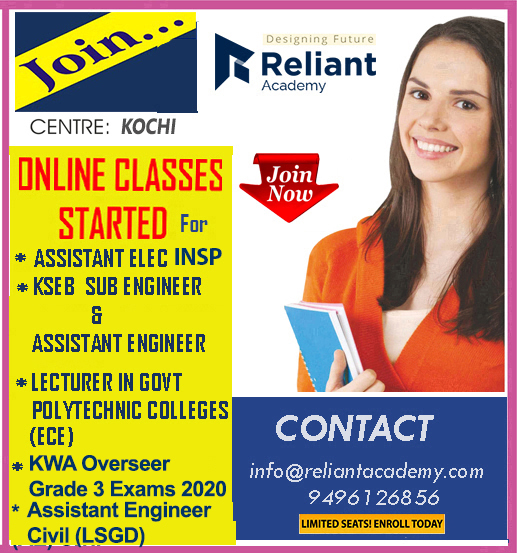 Reliant Academy is the leading SET coaching Center in Kochi, Kerala. Highly Experience Faculties and Online Practical Exams. Reliant Academy is the Best Place for P.S.C coaching AT Kalamassery, Kochi. Experienced Faculties & Digital Class rooms.